This image from the APEX (Atacama Pathfinder Experiment) telescope in Chile shows a sinuous filament of cosmic dust more than ten light-years long. In it, newborn stars are hidden, and dense clouds of gas are on the verge of collapsing to form yet more stars. It is one of the regions of star formation closest to us. The cosmic dust grains are so cold that observations at wavelengths of around one millimetre, such as these made with the LABOCA camera on APEX, are needed to detect their faint glow. The Taurus Molecular Cloud, in the constellation of Taurus (The Bull), lies about 450 light-years from Earth. 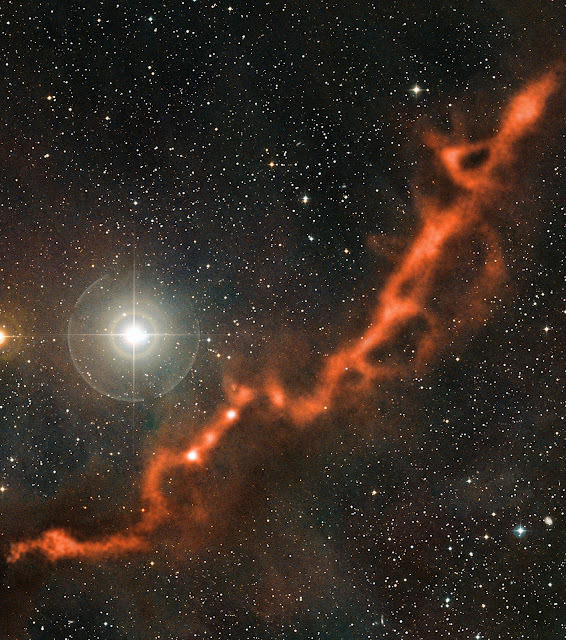 This image shows two parts of a long, filamentary structure in this cloud, which are known as Barnard 211 and Barnard 213. Their names come from Edward Emerson Barnard’s photographic atlas of the “dark markings of the sky”, compiled in the early 20th century. In visible light, these regions appear as dark lanes, lacking in stars. Barnard correctly argued that this appearance was due to “obscuring matter in space”. We know today that these dark markings are actually clouds of interstellar gas and dust grains. The dust grains — tiny particles similar to very fine soot and sand — absorb visible light, blocking our view of the rich star field behind the clouds. The Taurus Molecular Cloud is particularly dark at visible wavelengths, as it lacks the massive stars that illuminate the nebulae in other star-formation regions such as Orion. The dust grains themselves also emit a faint heat glow but, as they are extremely cold at around -260 degrees Celsius, their light can only be seen at wavelengths much longer than visible light, around one millimetre. These clouds of gas and dust are not merely an obstacle for astronomers wishing to observe the stars behind them. In fact, they are themselves the birthplaces of new stars. When the clouds collapse under their own gravity, they fragment into clumps. Within these clumps, dense cores may form, in which the hydrogen gas becomes dense and hot enough to start fusion reactions: a new star is born. The birth of the star is therefore surrounded by a cocoon of dense dust, blocking observations at visible wavelengths. This is why observations at longer wavelengths, such as the millimetre range, are essential for understanding the early stages of star formation. The upper-right part of the filament shown here is Barnard 211, while the lower-left part is Barnard 213. The millimetre-range observations from the LABOCA camera on APEX, which reveal the heat glow of the cosmic dust grains, are shown here in orange tones, and are superimposed on a visible light image of the region, which shows the rich background of stars. The bright star above the filament is φ Tauri, while the one partially visible at the left-hand edge of the image is HD 27482. Both stars are closer to us than the filament, and are not associated with it. Observations show that Barnard 213 has already fragmented and formed dense cores — as illustrated by the bright knots of glowing dust — and star formation has already happened. However, Barnard 211 is in an earlier stage of its evolution; the collapse and fragmentation is still taking place, and will lead to star formation in the future. This region is therefore an excellent place for astronomers to study how Barnard’s “dark markings of the sky” play a crucial part in the lifecycle of stars. The observations were made by Alvaro Hacar (Observatorio Astronómico Nacional-IGN, Madrid, Spain) and collaborators. The LABOCA camera operates on the 12-metre APEX telescope, on the plateau of Chajnantor in the Chilean Andes, at an altitude of 5000 metres. APEX is a pathfinder for the next generation submillimetre telescope, the Atacama Large Millimeter/submillimeter Array (ALMA), which is being built and operated on the same plateau. absolutely f a s c i n a t i n g!! !